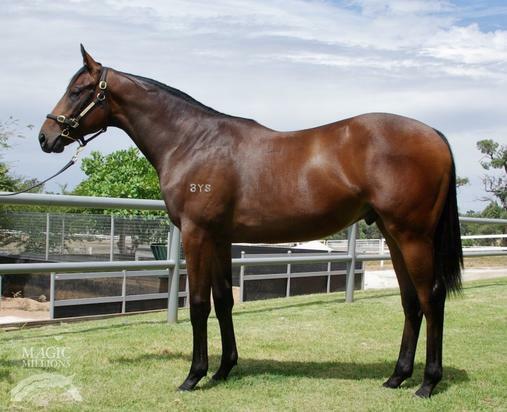 Check out our War Chant ex Chic Apparel colt, purchased as Lot 192 at the Magic Millions 2018 Perth Yearling Sale. WAR CHANT (USA) (Bay or Brown 1997-Stud 2001). 5 wins-1 at 2, Breeders' Cup Mile, Gr.1. Sire of 703 rnrs, 487 wnrs, 39 SW, inc. Silent Sedition (MVRC William Reid S., Gr.1), Kingsfort, Midnight Interlude, Chamberlain Bridge, Variation, Brilliant, Carlos Gardel, War Kill, Time Chant, Karen's Caper, Dainty Tess, Sea Chanter, Chattahoochee War, El Roblar, Chantski, Norman Invader, Asperity, Ballymore Lady, Doncaster Rover, War Room, War God, etc. CHIC APPAREL, by Zabeel. Unplaced. Dam of two named foals, neither raced. Lonely Boy. 3 wins from 1600m to 2100m, 2d ARC DA Peake P.
Orlando's Bride. 3 wins at 1200m, 1600m, SAJC Myer Fashion Trophy, 3d VRC Howitt & Kent-Kiernan H., MRC Bill Collins H.
Alpha Centauri. 5 wins from 1200m to 1800m, S$300,551, Singapore TC Novice P., Initiation P., Happiness & Prosperity S., HJM Asia Law Cup, Any Humour S., 2d Singapore TC Benchmark 89 H., Arenti Novice S., Big Maverick H., Gingerbread Man Graduation S., Class 4 H.-twice, 3d Singapore TC Brisbane Racing Club S., Happy Valley Graduation S., Graduation P., Class 4 H.-twice. Morpheus. 11 wins from 1600m to 4000m, NZ$116,250 in NZ. Ruomaza. Winner at 1350m in 2017-18 in NZ. Colonial Rose. Winner at 1200m in NZ. Mi Starose. Winner at 1600m in NZ. Producer. Blue Swede (O'Reilly). 8 wins from 1200m to 1600m, S$619,309, to 2017, Singapore TC Kranji A S., Hello Zagreb S., Super Easy S., Novice S., Reunion S., Kranji C S., Class 2 H., 2d Singapore TC Kranji A S.-twice, 3d Singapore TC El Dorado Classic, L, Singapore Gold Cup, L, Charity S., 4th Singapore TC Fortune Bowl, L.
COUNTRY ROSE (Centaine). 8 wins. See above. Miss Tenpins (Pins). 6 wins to 1400m, A$211,625, ATC TAB Place Multi H., Bledisloe Cup Festival H., Red Lea Chickens H., 2d ATC Bacardi Untameable H., Hyland Race Colours H., Tab.com.au H., Cellarbrations H., 3d BRC Bright Shadow H., L, ATC James Boag's Premium H., TAB Quaddie H., Schweppes H., St George Motor Boat Club H.
She Knows (Pins). 3 wins at 1500m, 1600m to 2016-17, WRC Sofia Rosa Cup, 2d Wairarapa Thoroughbred Breeders' S., L, Taranaki RC NZ Bloodstock Insurance Pearl Series H., 3d WRC Platinum Homes Taranaki H.